Granite Falls Health is an independent, not-for-profit health care system headquartered in Granite Falls, Minnesota. Since its founding as Granite Falls Municipal Hospital and Manor back in 1946, it’s been committed to providing high-quality health care and senior services to residents of Yellow Medicine County and surrounding areas. It offers a continuum of services, from birth through elderly care, and provides area patients what they need to live active, healthy lives. Granite Falls Health has gone through a lot of changes since Andrew Rosenau came to the hospital as IT Director in 2007. Throughout his tenure, he’s relied on Marco as his technology partner to navigate those changes. It all started with the need to cut down on printing costs. “We had a lot of individual printers, and printing costs were getting out of hand,” said Rosenau. The hospital turned to Marco for Managed Print Services. “With Marco, I don’t even have to think about printers. My team doesn’t have to waste time troubleshooting printer issues. We’ll turn in a ticket, and they’re here the same day to resolve the issue. All of the parts are covered. I don’t even have to worry about ordering toner. Marco automatically sends the reporting in and sends the toner,” he said. After Marco’s Managed Print services were implemented, Rosenau focused on the hospital’s aging network infrastructure. Marco helped Rosenau transition into virtual networks, which allowed the hospital to expand and grow. He said the V-LANs offer other important benefits as well. “Virtual networks have really helped us with security. We can create policies that allow only certain things to talk to each other within those virtual networks,” said Rosenau. From there, the hospital undertook its largest technology transformation—switching from analog phones to Voice over IP. The hospital chose Marco for the project, in part because of the premium support they provide throughout the entire process. 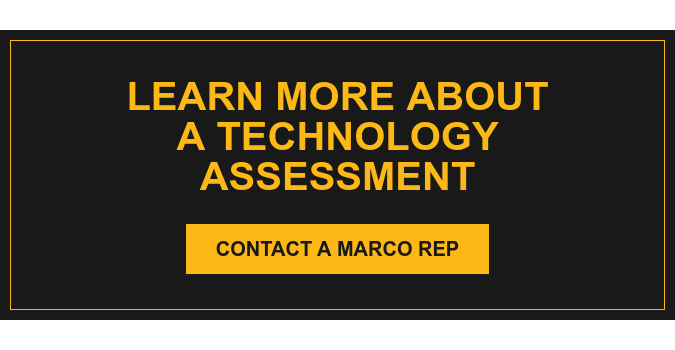 “Marco has great implementation and excellent pre-sale support. Before I even purchase, I know for sure what it’s going to do and if there are certain things it can’t do. Their presale is some of the best—if not the best—I’ve ever seen. The pre-sale tech actually knows the product inside and out. It’s not just a marketing person saying it’s great. They know the technical details and how it’s going to interact in my environment,” said Rosenau. He said the great service didn’t stop at presale, but continued through the entire implementation. “Right from presales, they have project managers who are top notch. They’re always checking in and making sure everyone is on task and has all of the information they need. It makes for a really smooth implementation,” he said. Rosenau said the new system has a number of benefits, but topping the list is convenience. “With Voice over IP, if someone moves desks or moves to a new office, we just move their phone. We don’t have to track down the wiring or change the wiring. If we add a person, we just program them in the system and plug in their phone,” said Rosenau. In addition to Managed Print services, network support and Voice over IP, the hospital also partnered with Marco for its video and surveillance solutions. Regardless of the technology, Rosenau knows the support will be there if they need it. “If we have an issue, we call or email Marco’s support center. If it’s urgent, they get someone right away. Otherwise, they get it on the schedule. I’ve never worked with a tech who isn’t trained. They’re all trained well. They know how the system is supposed to work, and they keep very good documentation on our network so another person can pick it up and know how it’s configured for Granite Falls Hospital,” said Rosenau. After a 10+ year partnership, Rosenau gives Marco a high recommendation. “They have great service and support beginning to end—from the first time you pick up the phone and talk to the account manager, all the way until after you’re implemented. It’s not like, ‘Okay, we installed this. We’re gonna move on.’ They have excellent service and support throughout the whole continuum,” he concluded.